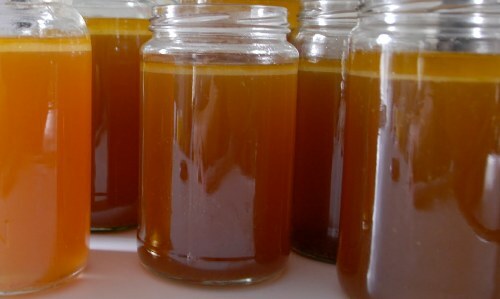 Homemade bone broth can help repair your gut and restore your healthy mucosal lining. Not only that, but bone broth is chocked full of collagen, gelatin, glycine, and proline (great article about their benefits here). In this post, I’m going to show you how to make a basic beef bone broth to help you heal your gut (and what to do if you don’t want to make it at home). For the best healing effects, find a source that uses certified Grass Fed Cows. (For extra credit, grab some knuckle to throw in the pot as well). You can buy bones and knuckle from a source like U.S. Wellness Meats or your local butcher. Local farmers that raise Grass Fed Cows will also be able to tell you which butcher they typically take their cows to and you can source it from there. 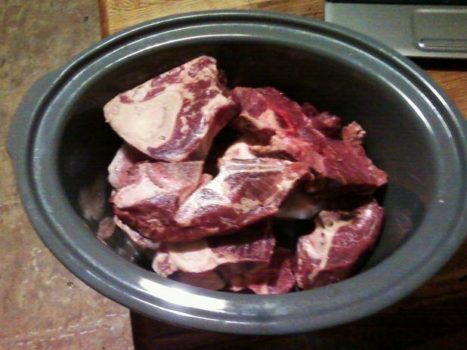 Add all 5 pounds of bones into a slow cooker. Don’t forget to add either a few shots of apple cider vinegar OR the juice from one lemon. They provide acids that help extract more nutrients from the bones. Next, fill the slow cooker with water (preferably filtered) and set it for 24 hours on low heat. HOT TIP: Sometimes the smell can bother family/friends/pets (ha-ha). Lately, I’ve actually been setting this out in my garage to cook so I don’t have to fill my house with bone broth scent (it’s currently winter in Michigan). Then, set it for another 12 hours or so… but timing is completely up to you. The longer you cook it on low the more the bones will break down and release nutrients into the broth. After about 30 hours, check the marrow bones to make sure the marrow has fallen out of the bone. Sometimes I have to pick out the bones with tongs and use a fork to knock the marrow out of the center. Once the bones have been slow cooking for 36 hours, turn off the slow cooker and let it cool down naturally for a few hours. Then, I will usually skim off the big stuff like the veggies and give them to the dogs. I have heard you can use the meat and veggies to make good soup but I haven’t tried it yet. It’s important to ask the question: how am I going to store this broth? I’ve heard mixed information on how long beef bone broth lasts in the refrigerator, so I’ve been sticking to a week or so. Keep that in mind when you store it. I like to drink about 8-12oz every morning so I need about 70 ounces to last me 7-days. Freeze what you’re not using and try to drink some every day. It’s also a great stock to cook with. Enjoy! All of those situations have applied to me at one time or another, too. Bone broth used to be exclusively homemade – but in the last year the sale of packaged broths has skyrocketed. This is good and bad – good because it means this powerful food is more accessible than ever. But the bad new is that not all packaged bone broths are comparable to homemade. We’ve tried a lot of bone broths, and the only brand we recommend now is Kettle & Fire. The folks at Kettle & Fire spent more than a year tweaking their recipe, finding sustainable and organic sources for all the ingredients, and perfecting a unique packaging system that keeps it fresh for up to 2 years in your pantry. If it isn’t homemade bone broth, Kettle & Fire is what I’m drinking. Hey there, Is there’s a vegetarian version that perhaps doesn’t provide all of the same benefits as the bone broth, but would still be a soothing alternative and nutrient rich alternative? Please advise. Approximately how much bone broth should 5lbs of beef bones yield? I would want the broth to of course be the most nutritious, but I usually can get 2 or 2 1/2 quarts out of about 6lbs, and I read elsewhere that it should be close to a gallon. But I “just cover” the bones with water, as I’ve read several places. So I don’t want to water it down, but I don’t want to be wasteful, as the bones I get are $4 to $5 per pound, and it gets expensive. Also I’m not sure how much to drink, really. I drink about 6oz twice a day, currently, with a meal. HI Kat – it really depends on how many other veggies you steam with it (if any), how much you skim off the top, etc. It sounds like they way your doing it is great:) We recommend starting small and drinking a couple of ounces per day. Some can tolerate more and some can tolerate less, so start small and find what works for you. There isn’t one magic amount your trying to work up to, but in general a few cups per day should be suffice. I was wondering if beef bone broth can be used in the intro diet instead of chicken broth? HI Stephanie – yes you can use beef broth. Just be sure to skim the fat off the top on the intro diet, as fat can be hard on an impaired digestive tract. Hi All, I FINALLY made a delicious broth that I enjoy drinking a couple times per day. I bought a book called “Brodo, a bone broth cookbook” by Marco Canora and found it has really specific guidelines for making an excellent broth. One thing he suggested is to add tomato paste. It adds a good flavor and gives it a deep color. AND, the broth actually smelled good while cooking! Hi. Made the beef bone broth. I must have done it wrong, marrow remained in some of the bones and it was really greasy broth. Can i reuse the bones since there is still some marrow left? Hi Sheryl – sorry you had trouble making the north. It is definitely a process of trial and error. We don’t see any problem with re-using the bones but if you do, you’ll likely have a less rich, flavorful stock the second time. Hi, I have been making chicken soup forever, so thought moving on to beef bone broth would be a breeze. So far all my attempts have produced rancid fat taste, is this what it is supposed to taste like? I even bought a new slow cooker thinking my old one wasn’t keeping an even heat. Any suggestions? Hi Carolyn – that doesn’t sound good!!! Are you using a high quality beef bone?? Choosing grass-fed beef will make a big difference in flavor! I do not like greasy/oily broth. My favorite meat to use is spareribs. One simple question. Can I just leave the marrow in at the end of the process? @Stephen – by the time the broth has cooked, the marrow should have fallen out. It has a lot of important nutrients in it, so you do want to get it out the bones and into your broth! Hi Andra – I’m so sorry you had this reaction to the broth! You definitely should not experience pain after you drink it. First: be sure you skimmed the fat off the top of the broth (after it cools, a hard layer of fat will form on the top of the broth that is easy to scrape off). Later on you may be able to tolerate all that healthy fat, but in the early stages many people have difficulty digesting fat and it is a good idea to remove it. The fat could have caused your stomach discomfort if you didn’t skim enough off. We recommend you begin at 1 capsule (or even just 1/4 capsule if you’re sensitive) per meal and slowly work your way up until you experience symptom relief (no more than 4 per meal). Most people use 1-2 capsules per meal. Finally, some people just don’t handle broth well – sometimes because of histamine intolerance or because they have gut disbyosis (SIBO). That’s great Brian 🙂 Keep up the awesome progress. 1. I only bought two large bones this time, think it will be enough? 2. Can i give my dogs the bones/fat etc after? 3. Add all the spices from the beginning, or add it later? Or add fresh periodically? Im using rosemary and green onion. 4. This can be reduced for stew right? Hi Lib! For this recipe, we recommend about 5 pounds of bones. Add your green onions and herbs (and other veggies you’re using) once the bones have been cooking for 24 hours and continue to cook for about 12 more hours. Steve feeds the veggies from his broth to his dogs after they’ve cooked. You can use the broth as a base for soup or stew or drink it straight. Hi Donna – great point! Steve (and myself) give the VEGGIES from the cooked broth to our dogs – not the bones! Cooked bones are dangerous for dogs, but they love the flavorful vegetables 🙂 Thanks for commenting! Many people have commented on having upset stomachs after drinking the bone broth. I too had this issue, combined with itchy eyes, congestion and a headache. I learned that initially, when healing the gut, one should start with stock cooked only for 4 -6 hours not bone broth cooked for longer periods of time. The longer cooking releases histamines and MSG which many cannot tolerate. After a while, one can move on to using bone broths, however, initially, one is supposed to start w/ meat broths or, i think, shorter term (4-6 hours) bone broths. I made bone broth for the first time yesterday and it was great. I use one of those new pressure cooker. I used a soup bone and a whole chicken. After 30 minutes, I took out the chicken and deboned it. Put the bones back in the pressure cooker and added carrots, celery, onions and garlic. I also added some seasonings ( grounded ginger, cumin, parsley, sea salt, fresh grounded pepper, basil, rosemary, thyme, soy sauce and sriracha hot sauce. This is what I used but you can use whatever to your taste. After 30 more minutes, I strained it. After it cool down, I put it in the fridge. The next morning I skimmed off the grease or fat. I drink it and it tasted delicious. We made some grass fed bone broth the other day, after my daughter drank some her stomach became very upset. Is this normal? Should I just give her small bits and build up her tolerance or stop all together? Hi Margarita, thanks for reaching out! Go ahead and start with smaller amounts and also make sure to skim the fat, as fat can be hard to digest for impaired GI tracts. I’d like to make bone broth, but cooking for a day is not feasible. Why do I not see any mention of a pressure cooker? Hi Brandi, thanks for reaching out! My best suggestion here is to use a crock pot, as this will allow for cooking through out the day. Be sure to ONLY use grassfed, or at least all-natural, bones. Numerous studies have confirmed toxic levels of lead in feedlot bones. Do not poison yourself or your family by using factory farm feedlot bones. 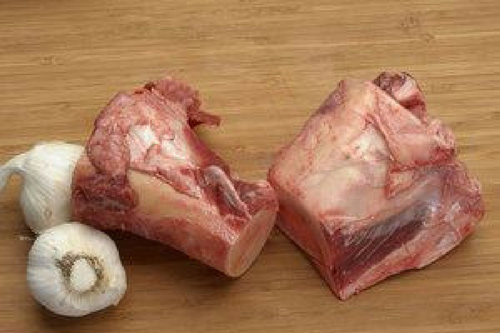 If you cannot obtain grassfed or all natural bones pass on making broth. Lead poisoning is the last thing you want. Google bone broth and lead for more info and make an informed decision. Two questions: store bought soup bones, not organic… Is this truly a terrible choice to make broth vs the overall benefits of the broth? Everything I’ve read says to use organic/grassfed, but this is often not an available option. For chicken, do you roast first, remove meat and use bones only or can you use the whole chicken (meat on) and get the same benefits/results? Thanks. Hi Rebecca, thank you for reaching out. Yes, grassfed is the best and this is where the most benefit will come from. There are still healing properties in general bovine bones and i would encourage you to continue making the broth with the bones you do have. I made a bone broth out of chicken and used a product from kosher beef (bovine) bone unflavored gelatin (bought from my local health food store) and was recommended on another site for making great broth. Made from beef collagen and bone. I cooked my broth 12 hours and added water every 1 1/2 hours because was loosing broth level during cooking. Thought I was making a mistake. The last 2 hours I mixed the bovine gellatin into 1/2 cup cold water and stirred into the broth. The herbs I used were: 3 bay leaves, rosemary and oregano from the garden. The only veggies I had: onions and 4 garlic. Also 1/4 cup of acv. Next day: I must say, for me the taste was delicious. It appeared liquity as it cooled, but overnight in the fridge became like jello. At that time, I skimmed off the fat. The taste, better than any store bought broth and it has been a great base for soups. The flavor must have concentrated over those hours. And yes, the cooking odor was just atrocious. Now I am ready to try the beef bones and ox tails. Can bone broth be taken in the Intro diet? Just a recommendation: cool your broth down using an ice bath. You should try to get the temperature down to 70 degrees Fahrenheit within 20 minutes to prevent spoilage bacteria from reproducing. If you’re making a large batch, you can place a pot full of ice in the middle of the broth to cool it down. If it’s a small batch, sit it in an icebath. I have GERD and have started to follow a Paleo diet. When I read that bone broth soothed the stomach I made some. Cooked in a slow cooker for 24 hours with beef bones, cooled and skimmed off all the fat. First few sips irritated my stomach. Second attempt the next day (2 tablespoons) had the same effect, has anyone else experienced stomach discomfort rather than the stomach healing properties. For my beef bone broth I add in carrots, rosemary, cinnamon sticks, tumeric, black pepper, whole onions and let it simmer for 12 hours. The bones I use are the huge bones from cow legs…I guess that would be the translation (I’m not sure what the term in English is) I use this bone broth for absolutely every thing. And its an amazing substitute for oil. It has cured all stomach issues I once had. Truly natures medicine. My husband is very ill from long term affects of having low hcl. He has a moderate allergy to beef, so I am wondering if beef bones for bone broth is a bad idea. He is also is allergic to may other meats but on a mild scale. Would really appreciate your thoughts on this. What are your thoughts about using this as a cleanse? I was advised to do use BBB for 4 days and I was not allowed to add any vegetables. What are you thoughts? Could You Mix The Broth With Rice Or Rice Noodles? Or Does It Defeat The Healing Benefits? Hi what’s the carb content of bone broth? Before adding celery at end? Done Buttonball fats shore high carb even without veg..? I have a ton of bones from the cow we just butchered. I simmered them on the stove for about 2 days. This is my first time making bone broth with beef. It seems I didn’t simmer it long enough, because some of the bones still have some marrow inside and it’s not completely hallow. But my husband is tired of the house smelling like wet dog, as he likes to say. So I have these bones that don’t look completely finished. Should I make more? My other question is about the marrow. As I pulled out the bones, the some of the marrow came out in a super jelly-like substance and is now floating in the broth and some of it is crumbly and still kinda hard. What does that mean? I don’t want to waste any of this goodness. Last question. Since we just butchered our cow, I have zero room in my freezer for pretty much anything extra. So I was planning on canning the broth for my pantry. Will I lose anything by canning it? Thanks so much. This is a great post and very insightful to newbies. I made my broth over the weekend. Went completely jelly like which was interesting! I heated some up to have some last night, took a few sips and got crazy bloated stomach from just a few sips. I just kept belching and it hurt so much. I really wanted to throw up but I couldn’t. Have a done something wrong or am I intolerant to it?? Or could it be the cider I had before it? I’m quite scared about trying it again!nany advice would be great. wide mouth Mason or Ball Jars. Fill about 3 inches from top as the broth expands as it freezes. Do not let the jars touch while freezing they can get pushed together and this will crack them as well. Do not place warm jars in freezer, broth must be room temp or cool. Lastly, place folded grocery bags between rows of jars to keep from touching and cracking because the glass will expand as broth freezes. stomach. Has to be evenly distributed, so heat in jar in crockpot and sip throughout the day. I have the red meat allergy from getting Lymes disease ( tick bite). Do you think the beef broth would initiate an allergic reaction? I understand its an allergy to the alpha gal in the meat, but I’m thinking the broth wouldn’t be a problem. Does anyone have any comments on this? Thanks. I would not for any reason try this, unlless you have about 3 eppi pens handy and a. hospital close by. This lyme/tick allergy is very serious. I’m no doctor but my niece has developed it and each attack gets worse. Recently she was at a cook out and brought some chicken burgers that she had made up herself. Never giving a thought to cross contamination. Well she almost died from cooking her burgers on the same grill and spatula. When freezing use glass bowls, like “Pyrex” or anything stainless steel (even cookie sheets or bakeware). After frozen pop out frozen broth and break up into pieces to wrap or bag. Some like to use ice trays but I choose to avoid plastic and aluminum. Hey! I have ordered your book and I’ve been on the diet for a total of 19 days so far. I cooked the bone broth for 36 hours as suggested and had two bowls of it this morning. Shortly after I started getting EXTREMELY nauseous and eventually vomited several times. What gives? Should I discontinue drinking this if its making me feel that I’ll? No, the mason quart jars are NOT freezer-safe, much to my disappointment. even with the headspace, they cracked. If you check out Ball/Kerr website (I think it’s the same company now, Jardin), they will indicate which jars are freezer safe and which are not. Their largest freezer-safe is a pint. That’s too small for us, since I make it once a month in a 12qt stock pot, the quart works best. So I’m currently searching online for an alternative. As for the broth, to boost nutrients and medicinal value, besides the veggies, I toss in some juniper berries, burdock root, dandelion root, etc. I sip it in the am with sea salt and a squirt of lemon juice. I’ve frozen soups in wide mouth mason jars and fortunately they have not cracked. Could it be that you filled it up too much? Or put it in while it’s still hot? I suggest trying the wide mouth jars and filling cooled liquid to the fill line. I’ve heard from others that the jars with curved ‘shoulders’ and narrower mouths are more likely to break (due to expansion and pressure at the point where the shoulder curve begins). I’ve frozen in Ball wide mouth jars and have had no problems. Just to be on the safe side though, I’ve stored numbers of filled jars in the freezer inside of a plastic trash bag. If they were to break, contents would be contained and cleanup should be easier. @Noelie, Thank you for the information on the quart size glass jars. I was just going to put my bone broth in them. I’ll have to lookup which jars are safe in the freezer. @MarielHeiss, this was going to be another question of mine regarding the marrow in which I grew up eating. Provided and I hope it will help my colitis/IBS problems that are flaring up more. Wonderful information from all comments……thank you! Try dry roasting the bones for 1 hour@400 degrees to intensify the flavor. I add a tbls. of chopped fresh ginger, a rounded teaspoon of turmeric, 2 teaspoons of fresh garlic once I have covered the bones with water in a crockpot. Once it simmers, add acv, parsley and bayleaf. Put on “HIGH”> After simmering 24 hours, I add leek, carrot, sweet potato celery and 2 tbls sea salt/ 10-12 peppercorns and more water if needed Simmer on low 6 more hours. Remove vegetables and bones. Scoop out any marrow that may remain and add back to the broth. 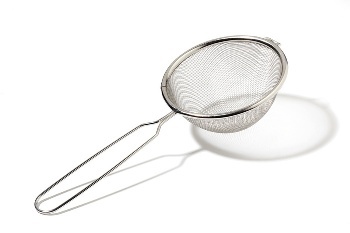 Process in blender or strain through fine sieve. You can pour some broth over the delicious stewed vegetables and a little cooked quinua as a meal, and of course drink plenty of the nutrient rich broth as a tonic and anti-inflammatory. Making my first bone broth – organic butcher sold me knuckle bones as he said that’s what he uses, but I am curious if these bones have marrow in them (and does it come out in the cooking?) My understanding is that the health benefits are from the marrow. Any insights? Thanks. Dang — In that PS, I meant to type “bold enough to try adding chicken FEET”. Question: I bought a crock pot when I started making bone broth last year, but stopped using it for broth after I read somewhere that long cooking of acid-infused (vinegar-added) broths could pull lead out of the crock. Have you heard of this? Now I use a large soup pot, and have found I have to be very careful not to ever let the water/broth come to an initial boil, or it will be hard to keep the temperature low enough, even with simmer plates between the pot and the gas burner. I have read that boiling is very detrimental to the healthful substances we are trying to extract. Tips/answers for some other readers’ questions: I believe most any animal bones can be used and be beneficial, especially if the animals were healthfully raised (or wild), but many people find lamb bone broth to have a particularly unappetizing smell. Please consider using/saving/consuming all the wonderful fat, especially if you are using bones/meats from organic/grass-fed animals. It is very healthful and an essential part of human diets. I roast beef bones before I start the broth and save the “drippings” for a marvelous cooking fat. I don’t skim off the fat from finished, chilled broth unless I have used a huge joint bone that produces an inordinate amount of fat. Unless you cannot digest fat properly, I believe it is healing as well as nourishing. Some nutrients are much better absorbed in the presence of fat. In the early stages of the GAPS diet for gut healing, when one is supposed to eliminate so many foods, the fat will provide satiety and calories. For more information, I recommend Gut and Psychology Syndrome (GAPS) diet/books; and the Weston A. Price Foundation, and the Nourishing Traditions cookbook by its founder Sallon Fallon. Final tip: none of the weird bits, fats, solids that people have been freaked out about are bad, that I know of (except, of course, bone bits), so don’t strain those out and throw away! If the appearance bothers you, use a blender to homogenize the final broth. This tip is especially good for chicken broth. I blend all the strained bits of skin and such (minus bones) into a puree and add it back into the broth (or soup — I turn most of my broths immediately into soups, and live on thise for days). We are not trying to make clear, French chef-approved consommé, but super-healing broths for our health. Don’t worry that the final product is cloudy — it will be delicious and healing. I understood in early stages (Intro and Stage 1) we are supposed to cut Fat out as much as possible. Is that not true? Since starting SCD I am constipated. I was asymptomatic prior. I wonder if I should jump ship and drop SCD. Any thoughts would be appreciated. That’s common and if that happens, increase healthy fats. That’s the number on thing that gets the bowels moving. Thank you for this recipe and all the helpful tips! I’ve been wanting to find a good bone broth recipe. I look forward to trying it. Hi thanks for this great article. It was very informative and helped me make my first batch. I finished making my broth in the slow cooker and just have a question for you. You mentioned that you should strain everything and keep the broth, but is it okay if you drink everything that’s in the broth, meaning the fats and other pieces from the marrow? I just figured that I would like to get as much of the nutritional benefits for the gut healing process, as possible, so I am just consuming everything in the liquid, rather than straining it. I haven’t used vegetables, just the bones and the broth. But it’s pretty tasty so far and hopefully will also help me heal. Thanks again! Could you please tell me more or less how much empty room a glass jar should have to allow the liquid to expand when freezing? Best regards and thanks a bunch for a nice site! Most mason-type jars have a freezer fill line toward the top of the jar. It should be the top-most line if you have the types of jars that have measurements on them, usually 1-1.5″ from the top of the jar. It’s usually best to refrigerate first to get cold and then pop into the freezer after. I’ve found when I didn’t refrigerate first that it changed the way the liquid expanded and although my containers had enough room, the center of the liquid built up into a mountainous peak that reached up to my lid, created pressure and actually cracked the jar. I haven’t had that problem when refrigerating first. You can always err on leaving more than enough head room. And as another commenter mentioned, you can always freeze with the lids off initially to make sure you won’t have any cracked jars. Once frozen if any liquid did expand past the jar lip so that you can’t fit the lid on, I’d imagine you could cover with plastic wrap and a rubberband to secure the contents. My attempt was a total disaster!! I used mostly beef marrow bones with onion, carrots and celery and cooked in a slow cooker for about 30 hours. I then let cool overnight. All went well up to here! My problems started when I started straining the broth. The marrow got caught in the strainer, so I tossed that into the strained broth as well. I ended up with a rather lumpy broth, so I used a hand-held blender to smoothen it! I ended up with a grey “mess”, which, after regrigeration, looked like a fat-infested, grey mess! I threw it all away! I think it was probably fine — or at least salvageable. I wouldn’t get hung up on a picture-perfect appearance (or lack thereof). All the elements you blended in should be good for you, unless, of course, you are not able to digest any fat. In that case, you could have heated it up again, poured it into a bowl or jar, chilled, then carefully scooped out the fat that hardened on top. The solid particles –marrow, bits of meat, etc., — usually settle on the bottom, which, if your broth gels nicely, should enable you to mostly scoop/pour out the gelled liquid and leave those solids behind for discarding. But I think your first instinct — to try to blend that cooked marrow and such in, with the intent to consume it too — was a good one. It’s supposed to be very nutritious. Don’t give up! You were doing well, and it probably tasted good, or would have with a little salt, pepper, etc. My broths are never clear consommes. but they are wonderful. And if you find it hard to take by itself, add extra meat and veg and such and turn it into soup. Good luck. 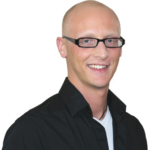 Wisechoicemarket,com. In addition, they have lots of other wonderful cultured foods . (OK, then theres the org potato chips cooked in coconut oil – yum!) They’ve been a lifesaver for me! Hi – Just an idea for those that find it too strong in flavor – I pretty much live on soups, but many of the store bought organic ones still being very high sodium. I often get prepared soups and mix them 50/50 with the appropriate (chicken or beef) bone broth to add the benefits of the broth and cut the sodium of the other soups, Sort of goes against the drinking a cup straight every a.m, but I figure any way I get it into my diet is good! Hi SCD team – I am wondering about MSG and how that fits into cooking bone broth? I’m not understanding the information on how over cooking can produce MSG and what that means for us health wise. Could you shed some light on this for me? Thanks so much. Thanks for this wonderful website. I was wondering if using pork bones would work. I love the taste of pork so just wondering? Pork doesn’t nearly have the same nutrition as beef or lamb. Nor is it that great for you. but still the color is a whitish cloudy look, it does not look like yours in the jars on this website. Do you think I did something wrong? I am almost afraid to drink it. Help/any suggestions? I spent almost $16.00 on the bones/all grass fed! you’re fine. It is supposed to be like gelatin when cold. If it were not like gelatin, I’d say you didn’t cook it long enough. the picture above is the broth when warm. Before refrigerating. When you heat it up to eat/drink, it will get liquid-y again. I will not stay gelatenous when you warm it up to drink, don’t worry. Just refrigerate, then skim the top white part of it (that’s too fatty to eat). Then scoop out a big glob of gelatin into a pot or mug, heat, and drink up. We raise our own grass-fed lamb. Any thoughts on how well this works with lamb bones? What about deer or elk? I’m thinking both in terms of flavor and nutrients. It is important to put a Tablespoon of vinegar to pull the minerals out of the bone. This takes me back to my mothers and then my cooking to make soup most of my life – good old marrow bones — fortunately in this country we are GM Free and all beef is grass fed so no problem there. However I do buy beef and especially chicken that is totally free range and organic. I now have osteoporosis (I’m older and its due to a drug I must take to well,live) – but my diet and nutrition are good. I followed your directions and it did not say anything about the proper way to eat this soup. I thought the white stuff on top maybe I could consume. This soup really hurt me bad. I think it would be a good idea to be really specific on how to serve this soup. My doctor said no one should consume the top layer of fat that forms on the soup expecially people that have gastritis or anyother gastrointestinal problems. I am not reccommending this soup idea it made me sick! Each morning, after I heat up a mug of beef bone broth, I grate some fresh ginger into it, and it is delicious!! The more ginger the better, and it is so good for you. It’s so easy too, because you can just peel the ginger root, stick it in a ziploc baggie, and keep it in the freezer. It grates very easily frozen, and tastes great. Ndver would have thought to add ginger….thanjs for the suggestion! Thanks for all the ideas. I put my bones in a roasting pan in the oven for 45 minutes at 450 drain the “fat” before putting the bones into my pan. If there is remaining fat (not gristle) on the bones I try to get as much off as I can. I then add water and about 1/4 cup or less of apple cider vinegar (with the “mother” on the bottom of the jar whatever brand); the first day I add lots of garlic and onions (leave the garlic cloves whole); after boiling the water I turn my stove down to barely lit so the broth stays at a scalding temp (not simmer) for three to four days. The second day I add more garlic and onions and toss in a bunch of cilantro. If I wish veggies I generally use fresh green beans and toss them in on the second or third day…I eat the veggies instead of tossing them even though as they rise to the top they absorb the “fat” as I believe it’ still good for you. Sometimes after the first day I transfer them over to my slow cooker but I like the idea of something cooking on the stove and check it every once in awhile so if it starts to simmer I can take the cover off and let it cool back down to the scalding temperature. For flavor enhancers, sometimes before I eat the broth I add toasted sesame oil and/or tamari sauce and crushed ginger. Any ideas? G’day, the bone broth tastes foul. How can I make it taste nice enough to drink? I use it in stews and soups but I’d like to be able to drink it as well. Is it an acquired taste? I’m normally pretty good with yucky stuff, I drink a cup of hot water with a whole lemon squeezed into it and some cayenne pepper and cinnamon each day and that doesn’t faze me. If it tastes foul, you’ve got some issues. It should taste like the broth when making a roast. Did you use rotten bones? Hi! Making the bone broth for the first time : ) So excited to try it and have it heal my gut. But I don’t have a slow cooker and I am making it on a pot on the stove top. Do times you post on this article remain the same? Like at 24 hrs add veggies and keep cooking for another 12? Will there even be any water left, won’t it evaporate? In order to cook my beef bones for 24-36 hours, I need to keep Sdding wAter due to evaporation. What effect will that have on the healthful qualities of the broth? If I didn’t keep adding some water, there would hardly be anything left at the end. Confused! Nobody has adequately answered the evaporation thing. is it detrimental to the broth to add more water during the slow cooking process or not? I’m watching my liquid getting less and less and wondering, Hmm! Hi Alan – sorry for any delay here. There should be adequate water when the broth is cooking – so if it seems a bit low go ahead and add in some more. I recently made beef bone broth by following this recipe. I froze that batch but was interested in canning my next one. Some say this is okay to do but I haven’t been able to find any two people to agree on time and pounds of pressure. Also have read that high heat, like canning, causes the broth to have more MSG. Any ideas? Do you freeze your broth in the mason jar? @Shawna-Lee – I do yes, works pretty well! You don’t want to fill the jar full if you are going to freeze, it will expand and crack the jar. It also helps to leave the lid off until frozen. Thank you for that advice. I would have had broth and broken glass all in my freezer! Do you keep adding water to the bones as the initial water evaporates? I would think you’d have a dry roasting of the bones in the slow cooker after 24hrs or so. Confused… and glad I’m not the only one who likes broth for breakfast! I hae the same question. I have a small crock pot. I’m not going to have much liquid left after 36 hours. Wondering if I could just keep adding water. I’m sure it’s safe to do so, just might have a watered down taste but was curious to know what other people do. After I strain my veggies and bones out of the broth, I like to take the soaked veggies and puree them with a ladle full of broth and some distilled water. This makes a great “soup” of its own, likely getting some major nutrients from all the time the veggies are soaking up the broth. I also like to take the strained stock, add fresh veggies, some cut up grass fed chuck (and any meat from the bones), salt/pepper plus a little fresh rosemary and make a beef/vegetable soup. To thicken this soup, you can add some of the pureed veggies to this. Pretty good stuff. and nothing goes to waste. Joseph and others, I have been making broth/stock/veggie soup the way you wrote above for 50 yrs.. Alternately, using peelings alone as throw-away-later veggies (children called it “garbage soup”) I’m writing to mention that one can use lamb, veal, turkey, etc., as well as beef and chicken; each offers different nutrients. It is helpful to add just a little salt, no pepper and the vinegar, which burns off, during cooking, as one will want to season it towards the end according to taste. Also, the parsley is best added toward the end of cooking. Someone asked about freezing…it’s almost a must with any quantity although, the gelatin/stock will last a very long time in the refrig. if allowed to have a coat of fat left over the top. You needn’t buy jars if you buy your tomatoes, etc. in jars unless they are too thin to hold up in the freezer; remember to leave a couple of inches for expansion on top of the jar. Thank you, Jordan, for telling us of the healing properties; I only knew of the chicken broth for colds and beef broth for recovery from gunshot wounds! Read those old westerns. Ha, Ha. Hi, what is your recipe for the beef bone broth? I roasted the bones in the oven for an hour then cooked the broth on the stove for 30 hours. I strained it into mason jars. This morning I took the layer of fat off the top so I could taste it but the broth was not gelatinous. It was liquid. So, what did I do wrong? Did I add too much water during the cooking process? or not cook it long enough? and will it have the same healing properties? Hmmmm that’s interesting Kate. It may be there wasn’t enough cartiladge, etc. to create gelatin. It’s probably still very nutritious, so don’t toss it. Next time try using a mix of soup bones and marrow bones. Other recipes recommend chilling the broth and removing the fat. Is that a good thing, or is the fat what makes it so good for you? I usually refrigerate the soup for couple of hours to let the fat solidify to be able to throw it away. I have read when high PUFA bones are used (chicken) the fat may get oxidized . – I bought the bones but they don’t have the meat on them, will it still work? I actually don’t want the meat here if I can avoid it. – Also, how do I know it is the BROTH that came out, and not just a soup – is there a way to check how gelatinous it is? Maximum gelatin/collagen is why I am doing this. Hi Kira, the bones should be fine. I’ve heard that roasting them in the oven before starting the broth can speed things up but I’ve never tried it. Thanks for sharing this recipe! I have a ton of soup bones in the bottom of my freezer & have been wondering how to best use them. I never realized how ‘healthy’ they could be! Awesome Angela, add some basil and oregano for flavor! We love borscht in our house (my kids are Russian) So it is an easy way to get the goodness of bones into the teenagers. Here is my borscht recipe. I’m not sure how this compares in nutrition to the regular way of making bone broth (or stock), but I have a lazy way that is more doable for me. I am at the stage where I can eat a bit of roasted chicken (as opposed to simmered/boiled), so I use a roaster that is just big enough for the chicken (hormone-free and organic when I can get it) and it has a lid. I toss some sea salt inside and sprinkle on the outside (about 2 tsp for a 4-6 lb chicken). Put the lid on and roast at 350-375 until very tender (20 minutes per pound plus 40 minutes works for me). The “juice” from the chicken fills up 3/4 of the roaster, so the bottom half of the chicken has been simmered, making the meat more digestible and creating a “bone broth” of sorts. After it cools a bit, I pour it off into a glass jar and stick it in the fridge. I can then scoop a jelly-like spoonful into a coffee cup and add boiling water. I can decide to skim off the fat or add a little, depending on how well I’m digesting that day. It seems like this “broth” is quite concentrated (I only get about a cup, depending on the size of the chicken), and I find that adding the amount of water my body can tolerate is working for me. I also like how easy it is. I also use it to make soups, adding a few spoonfuls to the pot of water and veggies. I hope this helps some people who are a bit intimidated in the kitchen or who are just tired of all the work (like me). I’ve heard cooking the bones in the oven for like an hour or two and getting them brown will make it a lot more flavorful as well, do you ever do that with your bone broth? In addition to cooking with it, I have a warm cup o’ bone broth in the evening on occasion. I do 1/2 water and 1/2 broth with some sea salt. If the taste is too strong, you could add more water. I only make bone broth every few months so when I prepare a vat of it, I freeze it in GladWare (I think they’re called small snack size) to get two servings per container. Yes it is plastic so if you choose this route wait for it to cool before putting it in the containers and don’t microwave the broth in plastic. It tastes delicious and I’m hoping that marrow-y goodness is preserved through the freezing. The ox-tail bones from our local farmer make amazing broth. Okay…there is no way I can drink this! The taste and smell is so strong. I think I am going to add more water, add some more salt and some meat…see if I can ingest it that way. Try not to water it down and use a straw to just drink it. When cooking it use spices in it from day one. I use cilantro, spinach, Mrs. Dash garlic seasoning, mild red pepper, and iondized or sea salt. Look must things that are good for us do not taste good. Tasting good is a new theory for 21st century… eat to live not live to eat. hey guys, i’m 18 and i’ve had U.C for about 10 months now. I’m currently having my 4th flare up, but I’ve been on this diet for the last month and my mum has been great preparing loads of SCD food for me (haven’t started seeing any improvements yet). we recently made some beef broth, and I was wondering how soon after the flare up I can eat it? it seems very oily – is it going to irritate my gut, or will it help? I’ve also been having chicken broth, apple-juice with gelatine, and mashed bananas for the last week. Is there anything else which might help during a flare up? any help would be very appreciated. Anything coconut will be very calming. Coconut milk with meals and just when your stomach feels icky…also coconut oil. Use it instead of anything you might cook with…you can melt and put into smoothies or spread on bread/toast to eat. The coconut is super healing I use it all of the time. Wow, no no no. Coconut milk gives me crazy GI problems, and I don’t even have IBD. I know many people find coconut milk is a gut irritant. It’s not allowed on the initial stages of the SCD diet, anyway, because it can cause problems for folks. It’s also high in FODMAPs, which can be a huge trigger for a big portion of the SCD population. Can you name a brand of coconut oil and recipes using it please. They rob us of healing. Most nuts and seeds have them. Lectin foods on the diet hence the reason it takes so longto heal. probably an irritant. Eat meat only from grassfed animals. Yogurt from grade A 2 cows. cool the broth completely. Take the fat that solidifies the fat and that can be used for other cooking. I throw the fat out. This has assisted me in healing my gut with no flares with a gluten free, yeast free, and wheat free diet. Every day drink 10 oz or so for breakfast like a cup of coffee. I meant “red meat” eater…sorry! Just realize that bone broth isn’t going to affect you the same as eating red meat. All marrow is good, as are the minerals from the bones themselves. You can have butchers clean the bones of meat pretty well. And then just filter off any remaining meat pieces. Should be just fine. Hey guys….just wondering what types of bones/pieces of meat you’d use if you did this with chicken instead as I’m not a “re meat” eater? 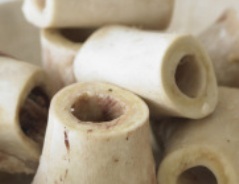 Specifically how do you know which are “marrow” bones? I usually make chicken soup using a whole chicken and save the carcass… then when I have a few carcasses saved up I will follow the same methods to make chicken bone broth… you can also throw in properly prepared chicken feet for more healing properties. What do you mean by properly prepared chicken feet? I just found a clean source and don,t quite know what to do ..I hear you needs less feet as they have the most collagen…is that true..looking forward to my first batch ? We recommend adding a few chicken feet to your other broth bones – not making broth just from feet!